Everyone loves an Italian sub, but they're always so monstrous and sometimes intimidating when you just want something not so gigantic. This version calls for a ciabatta roll, which is much smaller than a hoagie, but can still hold up to this ingredient-packed sandwich. Layers of roasted rosemary ham and salami are piled high with roasted red peppers, roasted yellow peppers, basil, arugula, olive oil, and white balsamic glaze. And if you want to be a purist and make the ciabatta buns, the mozzarella or the roasted peppers from scratch, then click each the hyperlinks previously listed. Begin by cutting your ciabatta roll in half and then toasting the bread in the oven or in a toaster for a few minutes. Drizzle both of the interior sides of the ciabatta with olive oil and then smear the white balsamic glaze and set the top half aside. 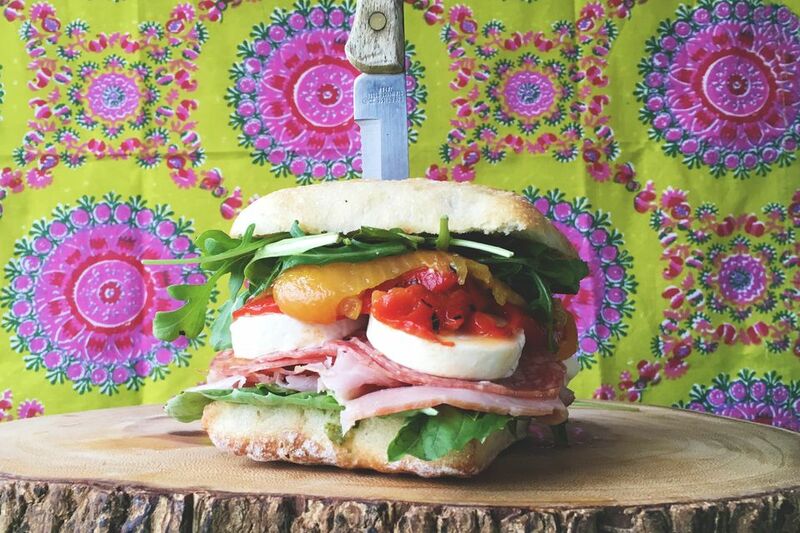 On the bottom half of the glazed ciabatta bun, add the basil, the salami, the mozzarella, and the roasted red pepper, the roasted yellow pepper and then lastly the arugula. Put the remaining half of the glaze ciabatta on top. Before serving, tightly wrap the sandwich in wax paper or butcher paper and slice it down the middle with a serrated knife. Leave the paper on the sandwich, only peeling the paper back for the bite you're about to take so that the ingredients don't fall out of the sandwich as you're eating it.